Florence January 7, 2015 · 16 min. readThis article may contain affiliate links. As I get deeper and deeper into the history of Italy, not only do I learn about the evolution of the modern world, but also the cause-and-effects that allowed such advancements to occur. We left Rome this morning and back-tracked on the same highway we took to get to Rome. After we stopped at the AutoGrill -- which is like any North American gas station -- we changed directions and headed north-west. Within 2-and-a-half hours, we reached Florence. 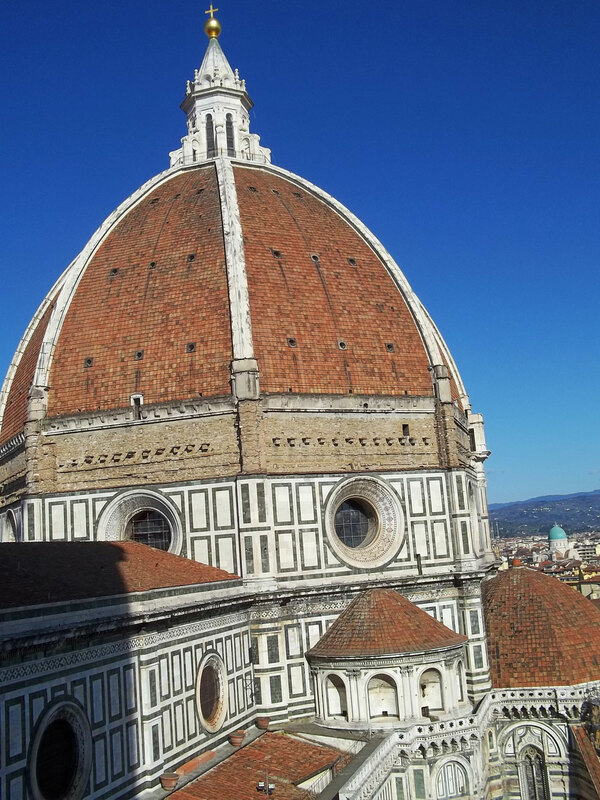 When we arrived in Florence, we drove up a very steep hill and arrived on top to see and exquisite view of the city, the mountains and the far-away glaciers. It was here that we took our group picture. It was incredibly windy up there, as it was all day, so I doubt the picture came out as crisp and pristine as it could have been. But, we'll find out in time I guess. After the photo-op, we took the coach back down the hill and into town. 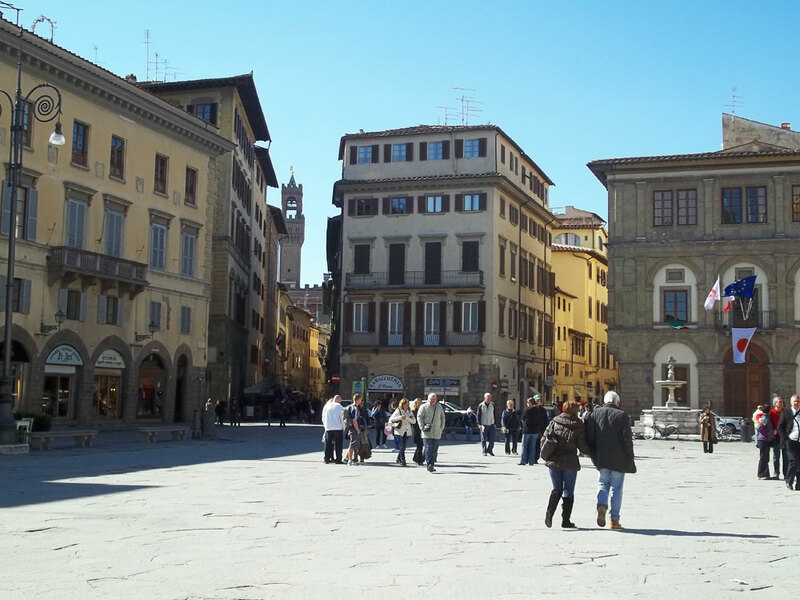 Once in, we hoped off the bus and followed Flip into the beautiful Piazza Santa Croce. 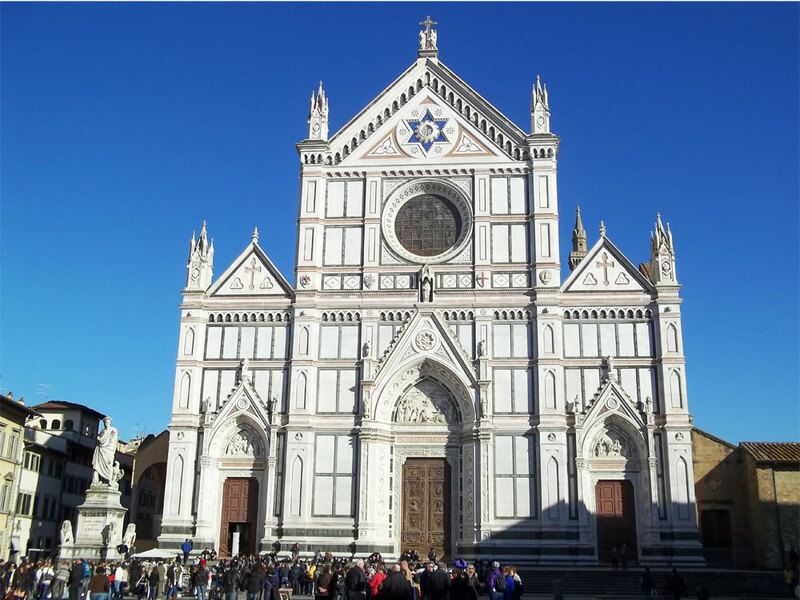 After a few pictures of the merchants, museums and the beautiful church emblazed with the Star of David, we headed to Leonardo's Leather Works and Gold Department. We got a quick tour of the leather store from a woman who began with a session with, "Bonjorono. As you may have noticed, my accent isn't Italian. It's Australian". That led to some hoots of applause from our Australians on the tour. It turned out that the woman at the store was from the same town as Tom, one of the members on our tour! After that was over, we got back to learning about leather. We learned how Italians make leather boxes and leather jackets and how to fuse pieces of leather together -- without giving away any trade-marked secrets, of course. Then the guide told us how to know if the street merchants outside were selling us real leather or "crap". She said that the merchants outside will use a lighter and show how their leather doesn't burn and must be authentic. She then showed us an actual burnt leather jacket to prove the myth wrong: it does burn. She then addressed the ploy merchants use for a "fresh factory" leather smell that used to be a clue to help distinguish between genuine and fake leather -- until some bozo came out with a "fresh leather" scent spray. She then told us about the law Florence made that said that people selling leather must actually have "Genuine Leather" printed on the inside of it. However, the woman continued, the merchants outside just print those words on a real leather strip and sew it into the fake jacket. She also said that if the price a street merchant sells "real leather" seems too low, it's probably fake. Lastly, she said to check the swede in the lining. She said this is the only real way an amateur can tell the difference between fake and real leather because nobody has been able to duplicate a texture like swede. We then got a tour of the Gold Department. One of the key items they sold was a "puzzle ring". A few hundred years ago, the guide said, a Turkish King came to Florence and saw the famous puzzle ring. He bought 200 of them and took them back to his harem in Turkey. When the ring is removed of the finger, it falls apart and can only be put back together by a jeweller (or, in modern times, reading the instruction manual). By giving his harem the rings, the King would know if any of them were unfaithful -- assuming that they would take off their rings during it. Afterwards, we were given 2 hours of free time until our walking-tour began. 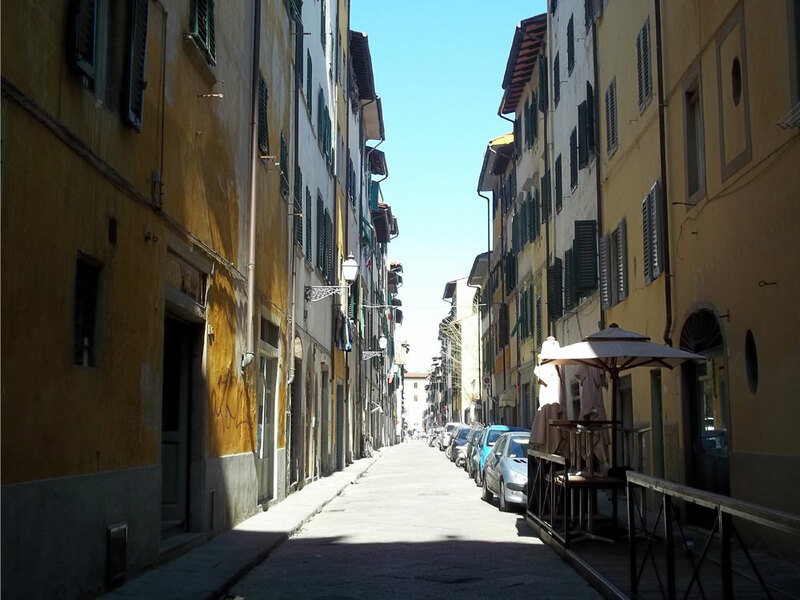 I then walked the streets and found the Fiume Arno -- a river that flows through Florence. In 1966, we learned, the river vastly overflowed and flooded the city and you can still see the dark strip on the buildings around the city, normally near the second-floor. 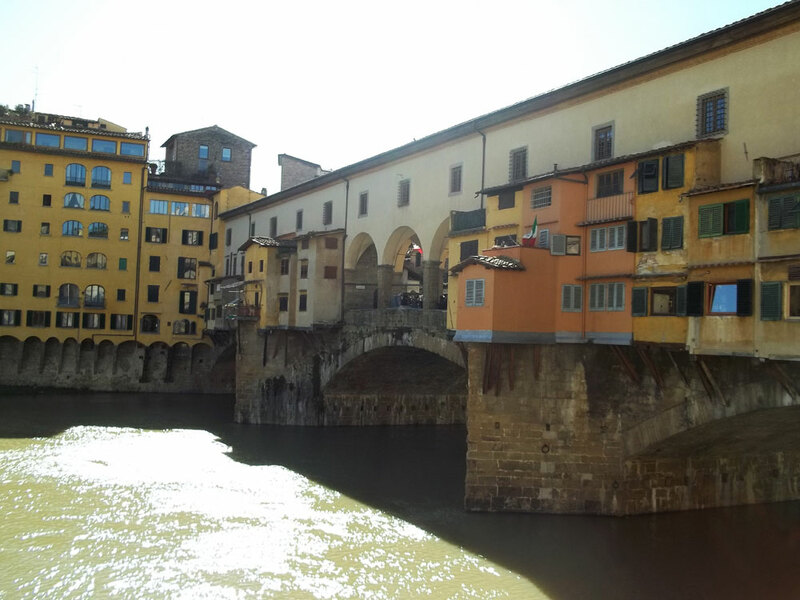 I considered going to the Ponte Vecchio -- a bridge with many shops on it that spans the river -- but figured it would be covered on the walking tour. 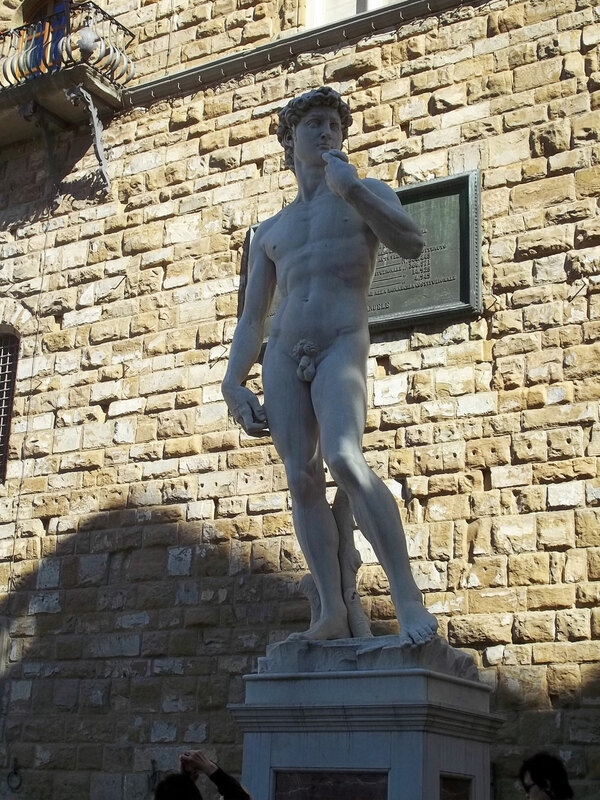 I realized then that I only had a few minutes to get to the Piazza della Signoria, where our walking tour was to begin! I got there a few minutes late and the tour guide was already talking about the temple on the edge of the plaza. She then discussed the hodgepodge of statues around us. 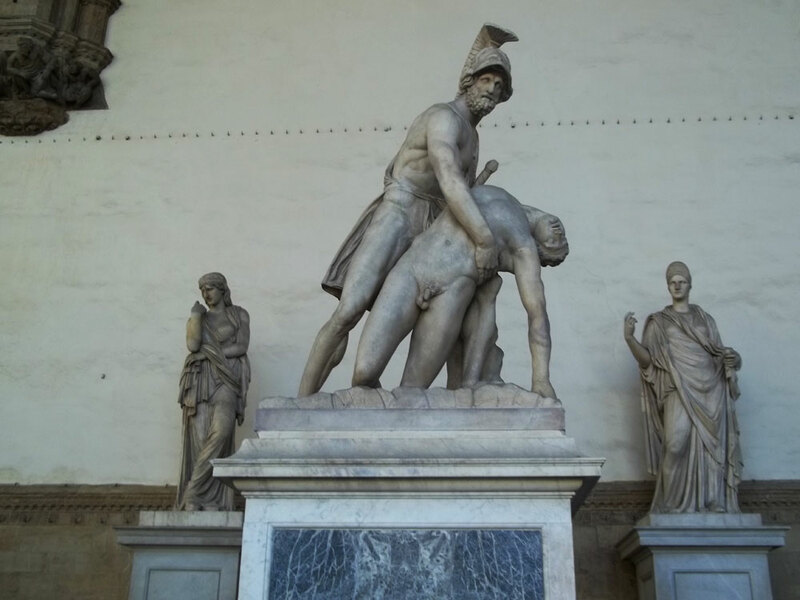 One of the statues showed Perseus holding the severed head of Medusa, while standing on her slain corpse. The statue was beautiful enough, but the real interesting thing was the crown on Perseus' head. Between the wings of the crown could be seen the carefully carved face of Cellini, the sculptor that would otherwise be hidden. As well, the head of Medusa, our tour guide said, had the face of Cellini's current girlfriend -- snake-hair and all. There were many other statues, one which showed Helen getting stolen from her lover Menelaus, which ultimately started the Battle of Troy. There were dozens of statues, of both Roman and Renaissance days and I can only remember a few of them. Just down the street from us, our guide said, was a walk-way between two buildings. It was here that Michelangelo and da Vinci lived. These artistes, our tour guide said, hated each other and always insulted each other's work. These two men were major parts of the Renaissance. The Renaissance began after the collapse of Rome when the Black Death swept Europe. At this time, the richest family in Florence (and probably in all of Europe) was the Medici family. When the plague hit, it killed off 35% of Florence's population -- mostly peasants. The Medici family (among others) were using these peasants to build temples and buildings because (much like today), the lower class has all the skills while the upper class just has the money. When the plague killed off all these people, however, the peasants began to demand money from the rich families to build their temples, and they were paid greatly. This is the beginning of what is now known as the "middle class".The famous artists I mentioned earlier were part of this "middle-class" and could get paid for focusing on their painting, sculpting and building skills. During that era, however, a lesser-known man named Girolamo Savonarola existed. Once the Renaissance had begun, he began to say that paintings of naked men and women were an insult to God and had to be burnt and destroyed. Because many of the artists were religious, they believed this as well and took their work to the Bonfire of the Vanities and destroyed it. The artists then went to the Medici family and asked to have their paintings back to destroy, but the Medici's said that since their paid for the art, it was now theirs and would not be burnt. Their art is all the art from that time-period that we have now -- with all the rest being destroyed. After the burning, Savonarola then made a foolish comment that only impure things could burn (this may have evolved into the idea of burning witches) and since he was completely pure, fire would not hurt him. The people of Florence then asked for him to prove this and he refused. The people then took him, tied him up with ropes and tested his theory. He died in the very square I was currently standing in. We then went down between two buildings and into the Uffizi. 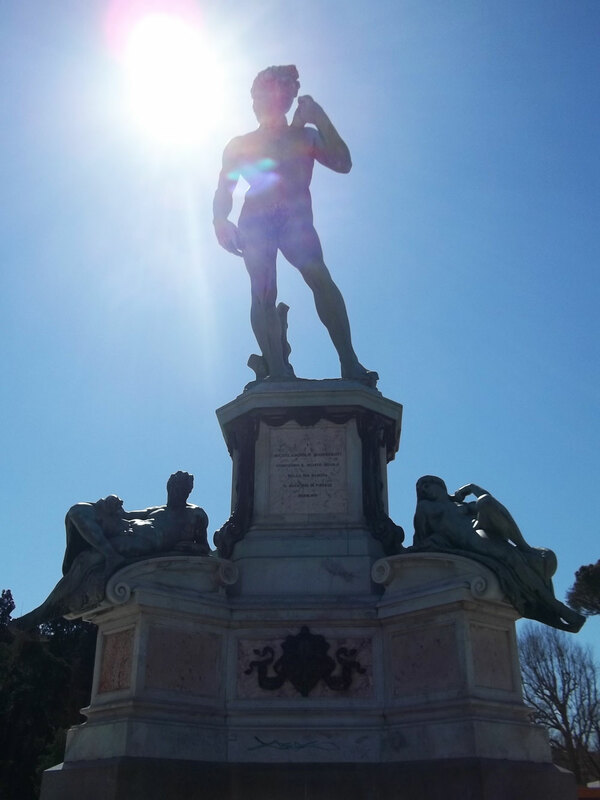 Here we saw statues of famous people: da Vinci, Michelangelo, Alighieri (the author of "The Divine Comedy"), Amerigo Vespucci (the man the "Americas" was named after), Galileo Galilei and many, many more. 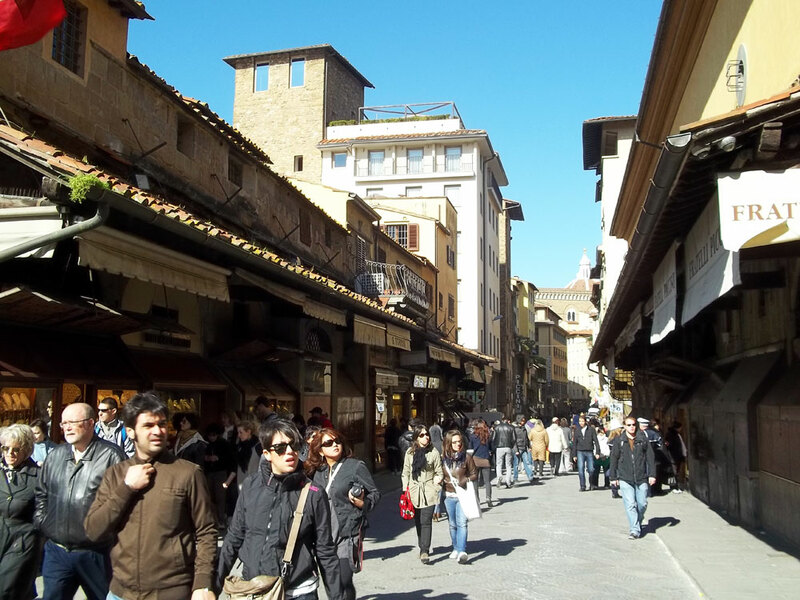 We then headed to the Ponte Vecchio and saw the stores. Hundreds of years ago, it used to be the center of Florence and was a fish market. Now it's a jewelry-store bonanza with over 87 stores on it. In World War II the bridges of Florence were being destroyed by the Germans to prevent the Allies from taking the city. When Hitler came to Ponte Vecchio, however, he told his people not to bomb it because he "liked it", which ultimately let the Allies invade through Italy. We then headed to the Piazza della Repubblica and learned that Florence was built on top of an 8th Century Roman City, which in turn was built on top of a 1st Century city. Because Florence is a massive buried museum, it has no subways. We then got to Piazza di San Giovanni and saw the Duomo, which is the "3rd Most Beautiful Church In Europe" (with the Sistine Chapel in the Vatican being the first, and St. Paul's Cathedral being the second). 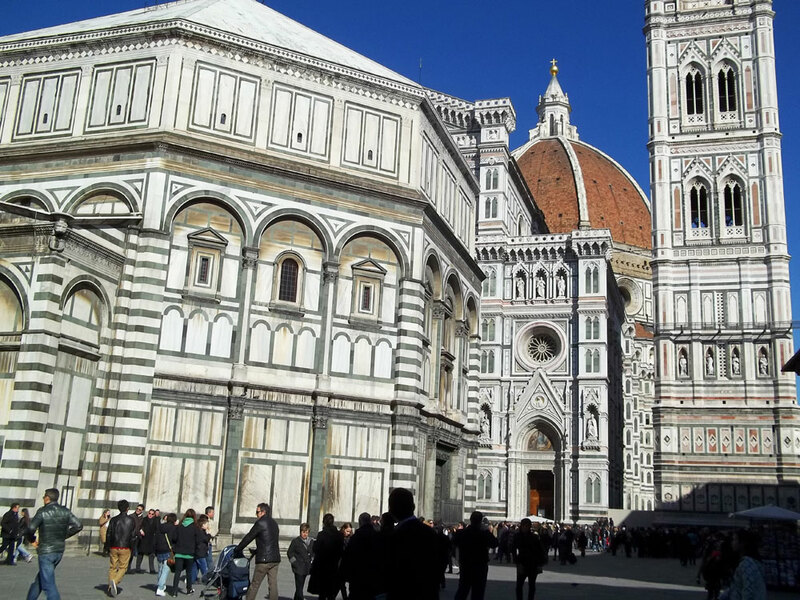 The Duomo took over 200 years to build and took over 10 architects to do it. Because of this vast time-frame, the outside is built in gothic architecture, while the dome is built in Renaissance fashion. We then went inside and learned that the church was actually built over another ancient church, that was over thousands of years old, which at this point really didn't surprise me. It was also here that Michelangelo had to lay on his back 30 feet above the floor so he could paint the dome. 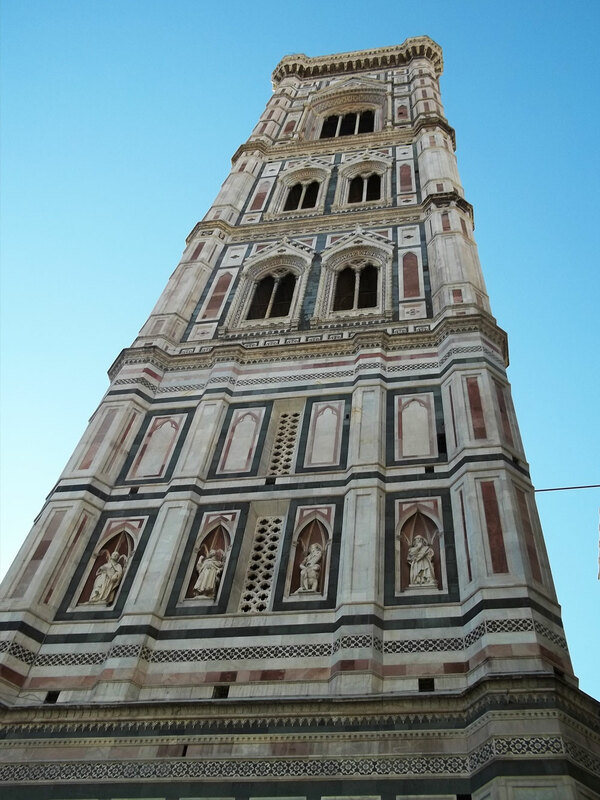 The tour ended there and we were told that just outside was Giotto's Bell Tower, which could be climbed for €6. Diasuka and I climbed it and I found it much, much easier than the Monument in London, even though it was over 100 stairs more. The view from the top is incredible and I greatly recommend it. Just remember that if you go up, you must come down and there's no elevator; just 414 stone stairs. 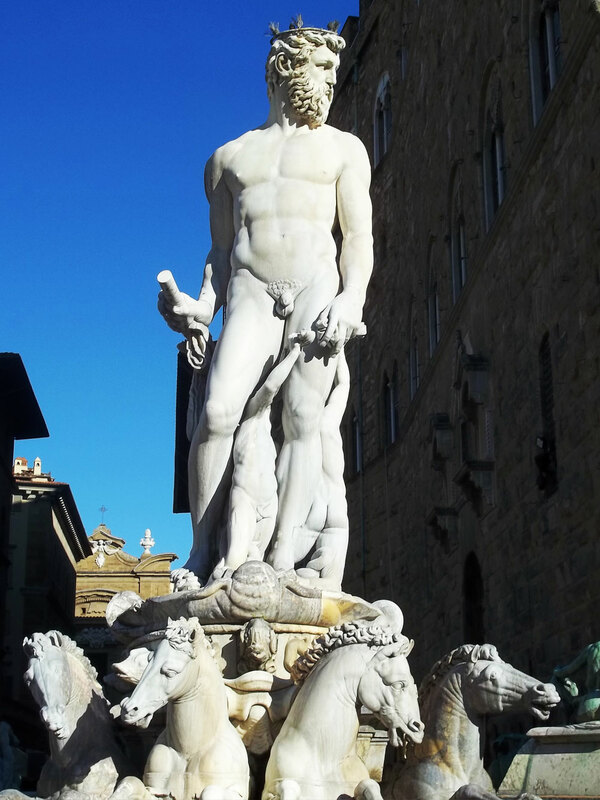 Afterwards, I went back to Piazza della Signoria and took pictures of Hercules, Athena, Mary, Jesus, Poseidon and beautiful fountains. I then walked to Piazza Santa Croce (the place we got off the bus) and met up with the group. We then left and went to our hotel to change into "nice clothes", and went out for supper at La Certosa and met up with another tour group, doing the same tour we were doing -- but in reverse! We then had four classic Italian dishes to eat -- antipasto, pasta, meat with salad and dessert -- along with an open bar, which means most of the tour members were drunk before the food even arrived. Supper here was really fun! There was an electronic organ playing, an accordion and even opera singing! After supper, we hopped back onto the coach and headed to the Space Electronic Night Club (the website isn't the best, but it's the "official" one). On the way there, Flip and Muffin cranked the music on the coach and drunken-aisle dancing commenced. I only joined in because of all the peer-pressure and chants of having my name called, but I was probably the only sober one. The coach stopped a block from the club and everybody disembarked, except 3 people -- me included. Muffin then drove us 3 back to Hotel Meridiana -- which was our hotel. My roommate for the night is Diasuka, and he went to the nightclub. That means that once again I must sleep with the hotel room unlocked. That concludes my day. I'm sure once I lay down I'll think of something else to write, but I'm sure you're getting tired of reading by now. On that note, goodnight! Talk to you tomorrow when I go to Switzerland! 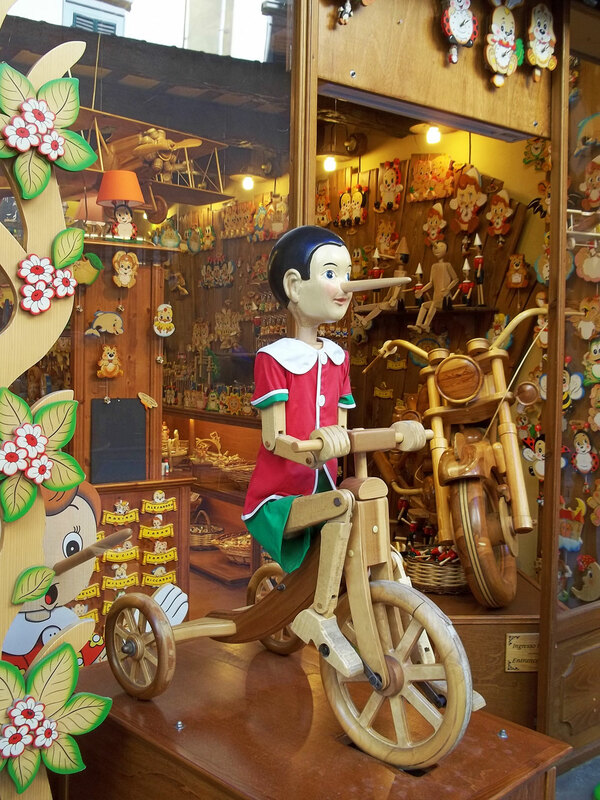 PS: For all the Disney fans, Pinocchio is also from Florence. Eastern State Penitentiary in Philadelphia, Pennsylvania shut its doors in 1970. A year later, in 1971, it would briefly reopen and house inmates from Holmesburg Prison after a devastating riot. After the prisoners were returned to Holmesburg, Eastern State would sit empty for over two decades. It would rot, decay and collapse. Trees and shrubs would grow into the structure and a clowder of cats would take residence. These hallowed halls would sit empty, the only noise being the chatter of startled birds and the trotter of feline paws. The following decades would see various discussions of what to do with the building. Eventually, it was decided to preserve it and turn it into a tourist attraction. Although it officially opened for tours in 1994, attendants would have to sign a waiver and wear hardhats before entering until 2008. They had 10,000 visitors the opening year, a number of tourists not seen in the prison since 1858. From 1829 to 1970, Eastern State Penitentiary underwent a variety of changes and transformations. This massive, sprawling, 11-acre complex was founded under the belief that solitary confinement was the cure needed to prevent criminals from committing future crimes. It was believed criminals who served in solitary confinement would turn to a higher power to reconcile with themselves for their crimes – hence feeling "penitent". To assist in this process, each cell was equipped with a slit window on the ceiling nicknamed "The Eye of God". It would be the only light source available to the inmate. A few months ago I entered a contest for a trip for two to visit Philadelphia on Two Bad Tourists. Normally contests like this are limited to United States residents so when I saw this one was open to Canadians I jumped at the chance. I've never won something like this before, so I actually forgot about it until I got the emailing saying I had won. Two Bad Tourists then worked alongside Visit Philly to organise the trip for me and my mother to explore Philadelphia for three days. Visit Philly paid for our flights, hotels and gave us a VIP Pass to experience the city to our heart's content. It is thanks to them that this trip is possible. Several movies and television shows have tried to capture the essence of Philadelphia over the years – from the boxing Blockbuster Rocky, to the paranormal thriller The Sixth Sense, to It's Always Sunny in Philadelphia and even Boy Meets World – but each described the city differently. There is no easy way to approach a city as dynamic as The City of Brotherly Love. With countless layers of art, history, religion and the paranormal, Philadelphia is a city unlike any other throughout the United States. One thing that surprised me the most about Philadelphia was the history. The city was founded and designed by William Penn, who is also the state of Pennsylvania's namesake. Born in London, England in 1644 he lived through The Great Fire of 1666 and The Great Plague of London from 1665-1666. Both events shaped Penn's life so he designed the city to be strictly stone buildings (to stop fires from spreading) and to have plenty of space between the buildings (as to prevent illness from spreading). This led to the older areas of the city to have winding corridors between old stone walls.